With the statuesque feeling of these long tall stunning tulips this bouquets brings a chic feeling into the home. The color gives that wonderful feeling of the late sunshine. Our bouquets come directly from our growers in California and are handcrafted on the farm, with the traditional Dutch spiral binding. Our partner Flowerbud will fulfill your order with care. The yellows give a wonderful sense of the sun shining into the home making any house radiant and joyful. This bouquet has been one of our great sellers. The Tickled pink with its stunning mix of pink lilies and the Queen Anne's Lace makes for a wonderful summery bouquet.Our bouquets come directly from our growers in California and are handcrafted on the farm, with the traditional Dutch spiral binding. Our partner Flowerbud will fulfill your order with care. 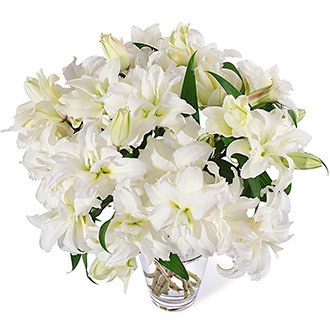 The color white gives a sense of purity and simplicity and yet the rose lily is so stunningly complex. what a beauty to have around the house. The soft colors of spring is what we all need. Love the pastel feel. 30 wonderful tulips that will make Easter, a feast. The stargazers are one of the strongest and most beautiful flowers available. A great seller especially in the summer month for their longevity! The Tulips are a wonderful representation of Holland and with these colors it will bring your home alive. we can all use a pick me up at times. Best way, is having flowers around! The Stun-her is a true beauty. Lavish and feminine. Exquisite to have in your home. The Telstar irises opens beautifully along side the lilies. Experience flowers beyond the vase.